Our free printable word mats are a fun way to introduce and reinforce vocabulary by season, topic or holiday. Display them on work tables, put them up on the wall, or laminate and use them as place mats. Lots more coming soon. Covering twelve 2D shapes, this colourful word mat would also look great displayed as a poster. Here's a simple word mat showing a circle, triangle, square and rectangle. Laminate and use as a table mat at the family table, or as a word mat on the classroom table. This useful word mat shows four 3D shapes that children most commonly learn first - the sphere, cube, cuboid and pyramid. This lovely mat would look great laminated and on display in the classroom or home, or scattered on tables to help with spellings during writing activities. This is a useful word mat printable which shows all the twelve animals of the Chinese zodiac, with words and pictures. 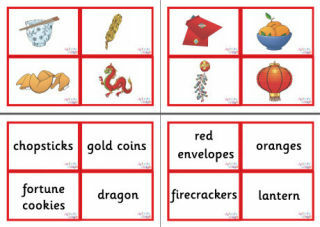 Why not laminate and keep available for your Chinese New Year writing activities? Print and laminate our Christmas word mat to use as a dinner mat for children learning to read, or to keep on the table or desk to help in festive writing projects. There are twelve bright and colourful images on our Diwali word mat. Use as a placemat over the holiday to help children become familiar with the vocabulary. This pretty Easter word mat looks great on display, or perhaps laminated and placed on tables for writing activities. You could also use it as a place mat for your child at home. Our farm animal word mat has some of my favourite of our animal illustrations. Print and display as a poster or laminate and keep on the desk and use as a writing aid. This football word mat is decorated with pictures and words of people and items relating to – of course – football! Printed out the display, or to keep on the table when kids are writing about football to help with spellings. Print and laminate this word mat featuring lots of lovely fruit – it makes a fun placemat for the kitchen table, or can be used of course in the classroom during writing activities. Print and laminate this lovely word mat featuring lots of things found in the classroom - it's perfect for use during writing activities and for helping new school starters learn vocabulary. Have a copy of our minibeast word mat on the table to help with spellings, display as a poster or even laminate and use as a place mat. There are ladybird and ladybug versions to choose from. This bright and cheerful Olympic word mat would make a fun place mat during the Olympics, just print and laminate. This useful word mat includes all sorts of Pancake Day vocabulary, including pancake ingredients, favourite toppings, and the utensils you need to cook them. Print and laminate this fun pet animal word mat and use as a placemat for the kitchen table, or for writing activities in the classroom. Display as a poster or laminate as a table mat - there are lots of ways you can use this colourful sea creature word mat. Print our colourful spring word mat and display as a poster or laminate and keep on the table to help with spelling. You could even use it as a fun place mat for spring! This lovely summer word mat is really colourful and looks great on display. You could laminate it for writing activities, or use it as a place mat - great for enjoying a meal outdoors! Use our Thanksgiving word mat as a poster or prompt to help with our vocabulary worksheets. Alternatively, laminate and use as a placemat to brighten up the Thanksgiving table. This fun word mat has pictures of lots of familiar vegetables and is designed to help children learn how to spell the relevant words. Why not laminate the page and use it as a placemat on the table, or keep it on work tables in the classroom as reference? Use our weather word mat as a poster or prompt to help with learning weather words. Alternatively, laminate and use as a placemat to brighten up any table!